Lee Roop at AL.COM is reporting that the Huntsville International Airport has taken the next step toward landing Sierra Nevada's Dream Chaser spacecraft on one of their runways. The airport has signed a contract to apply for a Federal Aviation Administration (FAA) license to land the small, shuttle-shaped ship in Huntsville. The licensing process will take two years. Local leaders see the license to land Dream Chaser as a step toward making the city a hub for the growing commercial space industry. Science payloads on the International Space Station are managed now by the Marshall Space Flight Center in Huntsville, and officials believe they can leverage that relationship to build a new space business in the "Rocket City." 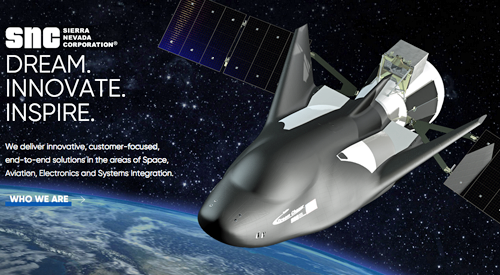 As part of that push, the city will be "working to share the capabilities of the Dream Chaser with potential users while marketing the workforce and expertise of the Huntsville region," the airport said in a statement. Partners with the airport in the licensing and marketing effort include Huntsville, Madison, the State of Alabama, the University of Alabama in Huntsville and the Huntsville/Madison County Chamber of Commerce. Sierra Nevada Corp. is supporting the licensing effort. NASA has added the company as an official station supplier with a contracted minimum of six cargo delivery flights. Its first two flights will be atop a United Launch Alliance Atlas V rocket made in Decatur. Sierra Nevada Vice President John Roth said that the company is excited to be working with Huntsville as the first commercial airport that will apply for an FAA permit to land Dream Chaser after an orbital mission. SNC feels that the ability to land a space mission on a commercial runway anywhere in the world is a big advantage of this vehicle and will bring space up close and personal to thousands of people who can come out and see the landings. This will put SNC in the forefront of commercial space activities and it is no surprise that 'Rocket City' is the first to join the firm on that journey.